Only a few left! Nice quality 1:18 scale (approx. 9" long) diecast by Motormax. Opening doors and hood with engine detail. These have been discontinued, so once we sell what we have - that will be it - forever. Click for larger photo. This is a 1/28 scale (6" long) diecast. The doors open, and they have pullback action. Highly detailed 1:43 scale (4" long) diecast of the New BMW 3 Series Coupe. Comes with a FREE acrylic display case. Click for more photos. LAST ONE! 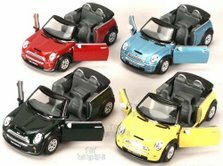 High quality, 1/43 scale (4" long) diecast car by IXO. The attention to detail is excellent. Comes with a FREE acrylic display case. Limited production. 128 Pages of amazing cars in competition, featuring some of the most famous BMWs in history. Covers every BMW 3-Series, from the economical 318 to the race-bred M3 Evolution, and all variations -- two-doors, four-doors, five-doors and cabriolets -- are featured. 128 Pages with 132 photos. 101 Performance Projects for Your BMW 3-Series presents all the necessary information, covers all the pitfalls, and assesses all the costs associated with performing an expansive array of weekend projects. Features 33 articles on the BMW M Series 1979-2002 from the pages of Road & Track magazine. 250 black & white and color photos and illustrations. Click for much more information and photos. Road & comparison tests, new model reports, technical & performance data. Includes 120 pages of articles from Road and Track. This portfolio of leading automotive magazine articles includes road, comparison, and long-term tests, new model introductions, and performance and technical data. Models covered: M3, E30, E36, E46, Coupe, Convertible, Racing, and Saloon. 200 pages, approx. 100 color and 200 black and white photos. This compilation of articles from leading automotive magazines includes new model introductions, road and comparison tests, and full performance and technical data. Models covered: E12 M535i, E28 M535i & M5, E34 M5 3.5 & 3.8, and E39 M5. 160 pages, approx. 100 color and 150 black and white photos. Road and comparison test, new model intros, specs, buying used, and performance data. Coverage includes B10 Turbo Alpina, 520, 525, 530, 535, 540, M5, and Touring. 172 pgs. Road and comparison test, specifications, new model intros, owner survey. Cover Coupes: 2800CS, 3.0, CS, CSi, CSL; Saloons: 2500, 2800, 3.0, Bavaria. 172 pgs. Road & comparison test, specifications, new model intros, used car guide and performance data. Includes information on Club Sport, Touring, 316,318, 320, 323, 325, 328, M3 and Coupe. 172 pgs. Now out of print, we only have a few left. Covering the 1600 to 2002 turbo models from the mid-Sixties to the mid-Seventies. Detailed information on restoring body-work, chassis, engine and trim, etc. plus production changes, color schemes, and history. 224 pages! The history of the 2002 �68 to �76, selling the 2002, press reports, a buyers guide, running a 2002, beneficial modifications, restoring a 2002, the 2002 in competition, technical specs, and more. Covers 6 cylinder cars. Collection of 54 articles on tech. data, road & comparison tests, long-term reports & owner survey. Models covered: 320, 320i, 323i, 325e, 325i, 325es, 325ix, H35, 333i, Alpina C2, B6S, M3. 180 pgs., 300 illus. Covers the BMW 6 Series from 1976 through 1989, including the 630CSi, 633CSi, 635CSi, 628CSi, Alpina and M635CSi. 216 pages. A collection of 34 articles covering the 850, i, Ci, SCi, 840, Ci, Alpina B12, 4.0, 4.4, 5.0, 5.6, & 5.7. Road and comparison test, specs, buying guide, long-term reports, and performance data. Covers Straight-six, V8 and V12 models. 136 pgs. Road and comparison test, specs, buying secondhand, long-term reports, and performance data. Covers Alpina B10, 728, 728i, 730, 732i, 733i, 735i, 735iSE, 745, and Automatic. 140 pgs.